A new and highly efficient method for generating mutant pigs by electroporating the CRISPR/Cas9 system into zygotes. Genetically modified pigs for biomedical applications have been mainly generated using the somatic cell nuclear transfer technique; however, this approach requires complex micromanipulation techniques and sometimes increases the risks of both prenatal and postnatal death by faulty epigenetic reprogramming of a donor somatic cell nucleus. As a result, the production of genetically modified pigs has not been widely applied. We provide a simple method for CRISPR (clustered regularly interspaced short palindromic repeats)/Cas9 gene editing in pigs that involves the introduction of Cas9 protein and single-guide RNA into in vitro fertilized zygotes by electroporation. The use of gene editing by electroporation of Cas9 protein (GEEP) resulted in highly efficient targeted gene disruption and was validated by the efficient production of Myostatin mutant pigs. Because GEEP does not require the complex methods associated with micromanipulation for somatic reprogramming, it has the potential for facilitating the genetic modification of pigs. Fgf10 is essential for limb and lung formation. The interactions between fibroblast growth factors (FGF) and their receptors have important roles in mediating mesenchymal-epithelial cell interactions during embryogenesis. In particular, Fgf10 is predicted to function as a regulator of brain, lung and limb development on the basis of its spatiotemporal expression pattern in the developing embryo. To define the role of Fgf10, we generated Fgf10-deficient mice. Fgf10-/- mice died at birth due to the lack of lung development. Trachea was formed, but subsequent pulmonary branching morphogenesis was disrupted. In addition, mutant mice had complete truncation of the fore- and hindlimbs. In Fgf10-/- embryos, limb bud formation was initiated but outgrowth of the limb buds did not occur; however, formation of the clavicles was not affected. Analysis of the expression of marker genes in the mutant limb buds indicated that the apical ectodermal ridge (AER) and the zone of polarizing activity (ZPA) did not form. Thus, we show here that Fgf10 serves as an essential regulator of lung and limb formation. Genome-wide inactivation of porcine endogenous retroviruses (PERVs). The shortage of organs for transplantation is a major barrier to the treatment of organ failure. Although porcine organs are considered promising, their use has been checked by concerns about the transmission of porcine endogenous retroviruses (PERVs) to humans. Here we describe the eradication of all PERVs in a porcine kidney epithelial cell line (PK15). We first determined the PK15 PERV copy number to be 62. Using CRISPR-Cas9, we disrupted all copies of the PERV pol gene and demonstrated a >1000-fold reduction in PERV transmission to human cells, using our engineered cells. 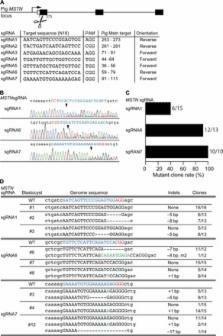 Our study shows that CRISPR-Cas9 multiplexability can be as high as 62 and demonstrates the possibility that PERVs can be inactivated for clinical application of porcine-to-human xenotransplantation. Pig cloning by microinjection of fetal fibroblast nuclei. Pig cloning will have a marked impact on the optimization of meat production and xenotransplantation. To clone pigs from differentiated cells, we microinjected the nuclei of porcine (Sus scrofa) fetal fibroblasts into enucleated oocytes, and development was induced by electroactivation. The transfer of 110 cloned embryos to four surrogate mothers produced an apparently normal female piglet. The clonal provenance of the piglet was indicated by her coat color and confirmed by DNA microsatellite analysis. [1 ]Laboratory of Animal Reproduction, Faculty of Bioscience and Bioindustry, Tokushima University, 2272-1 Ishii, Myozai-gun, Tokushima 779-3233, Japan. [2 ]Diabetes Therapeutics and Research Center, Tokushima University, 3-18-15 Kuramoto-cho, Tokushima 770-8503, Japan. [3 ]Division of Embryology, Fujii Memorial Institute of Medical Sciences, Tokushima University, 3-18-15 Kuramoto-cho, Tokushima 770-8503, Japan. [4 ]Research and Development Center, NH Foods Ltd., 3-3 Midorigahara, Tsukuba, Ibaraki 300-2646, Japan. [5 ]Laboratory of Animal Reproduction, Department of Animal Science and Resources, College of Bioresource Sciences, Nihon University, 1866 Kameino, Fujisawa, Kanagawa, 252-0880, Japan. [6 ]Transgenic Pig Research Unit, National Institute of Agrobiological Sciences, 2 Ikenodai, Tsukuba, Ibaraki, 305-0901, Japan. [7 ]Laboratory for Embryogenesis, Graduate School of Frontier Biosciences, Osaka University, 1-3 Yamadaoka, Suita, Osaka 565-0871, Japan. [8 ]Department of Orthodontics and Dentofacial Orthopedics, Institute of Biomedical Sciences, Tokushima University Graduate School, 3-18-15 Kuramoto-cho, Tokushima 770-8504, Japan. [9 ]Department of Life System, Institute of Technology and Science, Tokushima University, 2-1 Minami-Jyosanjima-cho, Tokushima 770-8506, Japan.